Of course, I’ve got an especially unspecial fossil fish to round off the year. Vast expense was spared to bring you just another underwhelming fossil fish to mark one step closer to your inevitable end. First up though, it’s END OF YEAR ROUND-UP FILLER CONTENT. Here they be, just four three teeth confusingly identified as Diplodus sp. collected from the Permian of Texas by Underwhelming Fossil Fish of the Month Hall of Famer, D.M.S Watson. I say confusingly, not just because your mind wants to read Diplodus as Diplodocus but because Diplodus is a genus of living sea bream who: do not have teeth like this and whose fossil record only goes as far back as the Eocene (roughly 50-30 million years ago) which is 200-250 million years after the as-advertised-on-the-label Permian. Something fishy is going on and remarkably can you believe this is the first time I have used that joke in this 40-something-long series? Wow. LDUCZ-V1602 ‘Diplodus sp.’ and the UFFotM photographer had a bit ‘o’ festive fun with this not standard imaging. Note the blue dots on EVERYTHING and the apparent loss and apparent rediscovery of one of the teeth unless there’s a spine in tooth’s… teeth’s… toothies'(?) clothing here. What we have here readers, is a classic case of FOSSIL FISH TAXONOMY TOM FOOLERY and like most FOSSIL FISH TAXONOMY TOM FOOLERY we can trace it back to legendary fish palaeontologist, Louis Agassiz. The name was used in 1843 by Agassiz to describe teeth found in Carboniferous and Permian rocks in association with spines from freshwater sharks called xenacanthidans. Unfortunately, the name was already in use for sea bream in 1810 by another author and ever since then both names seem to co-exist, which you may remember from lessons about taxonomy and classification at school, shouldn’t happen at all. Generic names, at least within animals should be unique. Here’s Diplodus with reference to Carboniferous sea bream fish on the Palaeobiology database and here it is with reference to living sea bream on the World Register of Marine Species. In other words, its a mess and these four three teeth aren’t likely to be from Diplodus at all as we shall see. Preservation Although we appear to have a selection of nice three dimensionally preserved shark teeth here, if I am interpreting these fossils correctly, each of the four three teeth has a key bit missing to be very misleading. 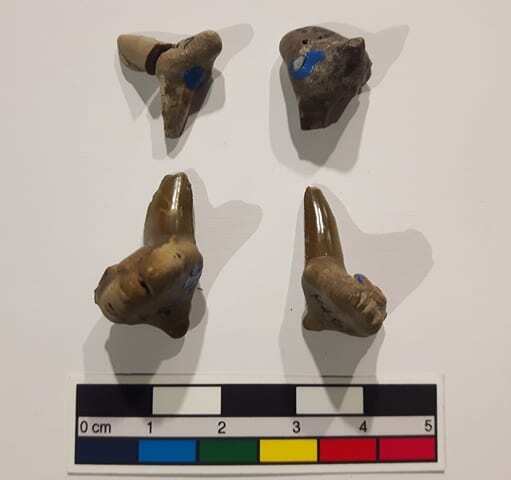 As the below image shows better, these teeth should have two cusps like these images show forming a pronged tooth which is distinctive for this group. Both of these teeth are missing a cusp on the right hand side as viewed here. These should be pronged teeth, a distinctive characteristic of xenacanthidan teeth. 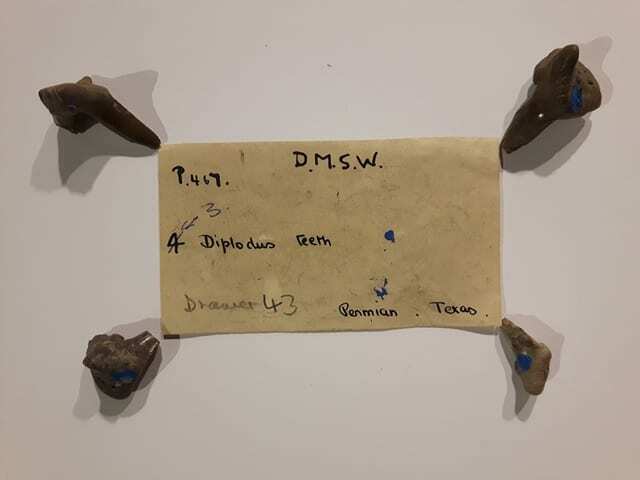 If I’m correct (78% certainty) then these are teeth from a xenacanthidan fish, freshwater sharks that lived from the Carboniferous to the Triassic which now makes more sense with the label for these specimens. These V shaped teeth were thought to have been used for eating hard scaled fish and crustaceans. Research The Bat Computer is coming up with an almost total blank on any particular research direction for xenacanthidan sharks as a group beyond, “they were around, I guess”. In Society Remarkably and presuming when they were really running out of animals to choose from, the 43rd episode of River Monsters, quality wildlife programming as you can tell from the name, featured Xenacanthus, a xenacanthidan shark. FULL DISCLOSURE: I’ve not seen the episode, it was this Wikipedia article that drew my attention to it. FULL FULL DISCLOSURE: I probably won’t see it either. * Note to self before publishing- work out whether this section will rhyme or not. DO NOT LEAVE IT as kinda rhyming sometimes. Happy new year to you and everyone at the Grant Museum. Life is good so long as this blog continues. Fun times. Superb work from the tireless author. We are treated to everything – an unclear number of underwhelming fish parts, poetry, reference to Wikipedia and some chance of being underwhelmed by a fishing TV programme too. And a fishy joke. 2017 can only be a let down from these dizzy heights!